This book is a contemporary study of a citizens’ association and its role during the last three decades in preserving a historic downtown district in Hamilton, Ontario. It echoes the experience of many older inner cities throughout North America blighted by decaying downtowns, demolition of heritage sites, inappropriate high-rise residential development, intrusive traffic and other ills. 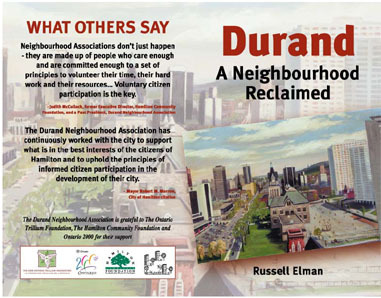 The story of the Durand Neighbourhood Association shows how public participation can make a difference in a community. It has relevance for anyone concerned about the ongoing reshaping of our urban municipalities.